Central Workshops of City of Cardiff Operational Services. Entry Name: Central Workshops of City of Cardiff Operational Services. Location: On N side of road, backing on to railway. Built circa 1902 as Clare Road Depot for Cardiff Tram Service. Contractors Messrs D W Davies. In 1923 some alterations to allow trams to enter from S instead of N.
Long multi-gabled building in red brick; slate roofs with glass lights, stone copings and kneelers. Eleven gables with louvred oculi. Two bays to each gable generally have 2 arched recesses with lunettes. Second and fifth gables have tall doors; large door between gables 9 and 10. To L, early C20 block links with two-storey 4 window block in red brick. Short screen wall to road. 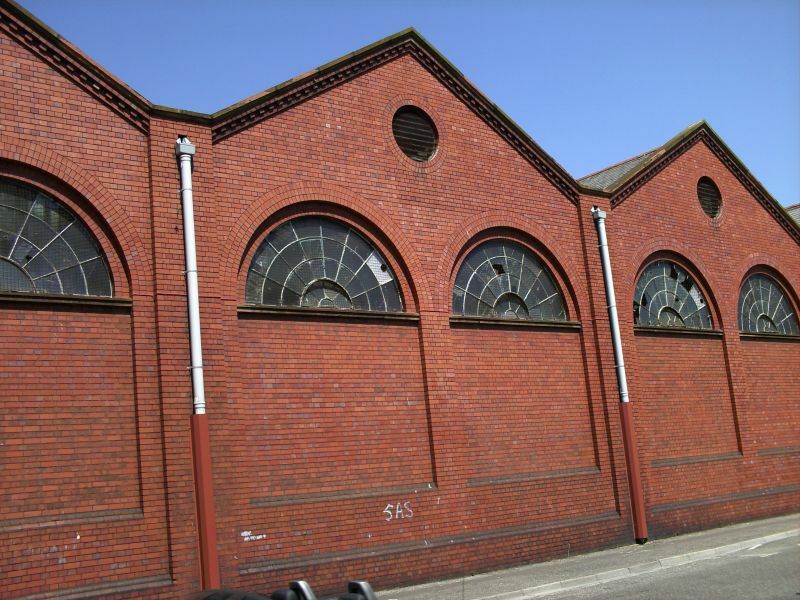 Listed as rare surviving large building from a major tramway system, illustrating the transport history of Wales' largest city. To N of west end of platforms 1 & 2 of Cardiff Central Station. Main entrance in castle Square; rear entrance from car park in Penarth Road. On S side of Central Square. To NW of County Club. On corner with Park Street. Attached on N side of Head Post Office.